110 Connecting Blocks enables you to quickly organize and interconnect phone lines and communication cable. 110 Block system is used in equipment rooms or in remote and intermediate wiring closets to connect voice or data wiring to customer premise equipment. The 110 block improves on the 66 block by supporting higher frequencies and using space more efficiently. Early residential telephone systems used simple screw terminals to join cables to sockets in a tree topology. These screw-terminal blocks have been slowly replaced by 110 blocks and sockets. Modern homes usually have phone service entering the house to a single 110 block, whence it is distributed by on-premises wiring to outlet boxes throughout the home in a star topology. At the outlet box, cables are punched down to standard RJ-11 sockets, which fit in special faceplates. In commercial settings, this style of "home run wiring" was already in use on 66 blocks in telecom closets and switchrooms. The 110 block has been slowly replacing the 66 block, especially for telephone usage. The 110 block is often used at both ends of Category 5 cable runs through buildings, as shown in the image. In switchrooms, 110 blocks are used to connect cables to patch panels. At the other end, 110 connections are found in the modular sockets in faceplates. 110 blocks are preferred over 66 blocks in high-speed networks because they introduce less crosstalk and thus are certified for use in Cat5 systems. Use wall mount or rack mount Leviton 110-style eXtreme Cat 6 cross connect blocks to provide for a centralized termination of Cat 6-rated cable. You can be assured that your connection will support high speed data or voice, security, high megabit and shared sheath applications. These 110-style blocks are UL listed, TIA/EIA 568-B2.1 compliant, and exceed Category 6 standards. Leviton Category 5E GigaMax 110 Style Cross connect products provide fixed terminations that support high-speed category 5E data, voice, and security applications. They include wall and rack mount wiring bases, blocks, clips and kits. These wiring boxes are available in 50, 100 and 300 pair designs with or without legs. They are made of fire retardant plastic UL listed 94V-0 and comply with TIA/EIA-568-B2 requirements and meet FCC Part 68. Use a Cat 5 E 110 style base or kit in telecommunications equipment rooms including building entrance faculties or small telecom closets to provide a fixed cross connect termination for high speed data, voice or security applications when using category 5E cable. The 110 racks mount bases mount to any 19" distribution frame or hinged wall mount bracket. The wall mount bases mount to walls or backboards. Available in three pair count sizes : C-3,C-4,C-5 to support terminations for voice, security, category 5e data when used with category 5e cable. Siemon’s S110 field termination blocks combine category 5e performance with unparalleled installation features and are ideal for use in cross-connect and consolidation point applications. Each kit includes adequate connecting blocks to complete each 25-pair termination strip on the S110 wiring block (e.g. S110AB2-100FT includes five 4-pair and one 5-pair connecting block per 25-pair termination strip or a total of twenty 4-pair and four 5-pair connecting blocks). 25-, 50-, 75-, and 100-pair blocks are available without legs for mounting directly to walls. 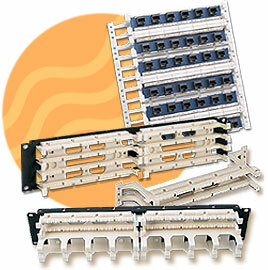 If cable routing is required behind the blocks, 50-, 100-, 200- and 300-pair sizes are available with mounting legs. The 50- and 100- pair sizes offer detachable mounting legs to assist in routing cables behind blocks during and after installation. S110 panels allow wiring blocks to be mounted directly to a 19 inch EIA rack. Each panel includes adequate connecting blocks to complete each 25-pair termination strip on the S110 block (e.g. S110DB1-100RFT would include five 4-pair and one 5-pair connecting block per 25-pair termination strip, or a total of twenty 4-pair and four 5-pair connecting blocks). 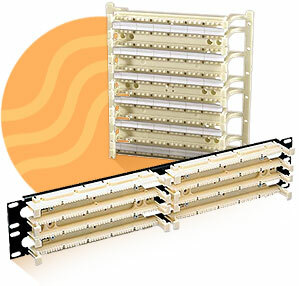 Panels without cable managers are available in 100-, 200-, and 300-pair configurations. 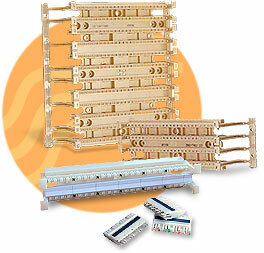 Panels with cable managers are available in 100- and 200-pair versions. Siemon’s S700 series blocks provide a simple interface method between 25-pair assemblies and punchdown fields using easily accessible connections. The blocks feature both fields on the face of the block eliminating the need to trace cables or access the rear of the block when making connections. Each block comes with label holders and white designation labels as well as hook and loop hold-downs to secure the 25-pair connectors. The S110 modular jack block provides a pre-wired distribution solution for network applications. The modular jack block can be wall mounted and is typically used to connect horizontal cabling to network equipment. Connections are made by terminating 4-pair horizontal cables to S110 connecting blocks and patching to active equipment. Suttle's SpeedStar 110-Cross Connect System provides a high performance Cat 5e or Cat 6 solution for data communications management in a telco closet, main distribution frame or consolidation point. 110-Cross Connects are ideal for use where space is limited or a cost-effective solution is preferred over a modular patch panel. The Suttle Category 5e 110-Cross Connect System is available in easy-to-order kits or individual components.